Save pictures of designs and products you love to a private board for you and your team. Add images with ease. Create a list of empty specs for the appliances, lighting, fixtures and other items you need. Or use one of our templates. Add items with ease using the Pocketdoor Chrome extension or the Firefox add-on. Or use our mobile apps (coming soon!). When you and your team decide on options, items in your Buy List are marked “Ready to Buy”. Save options for each item so you can decide on that perfect product later–or get approval from another member of the team. Set the buyer for each item so everyone on the team knows who is buying what. No more confusion over who is buying what. Let everyone on the team know when each item is needed so you can stay on schedule. Give every buyer on your team the web link or local instructions for how to buy the right item. Move or copy items from one project to the other with ease and save your time and energy. 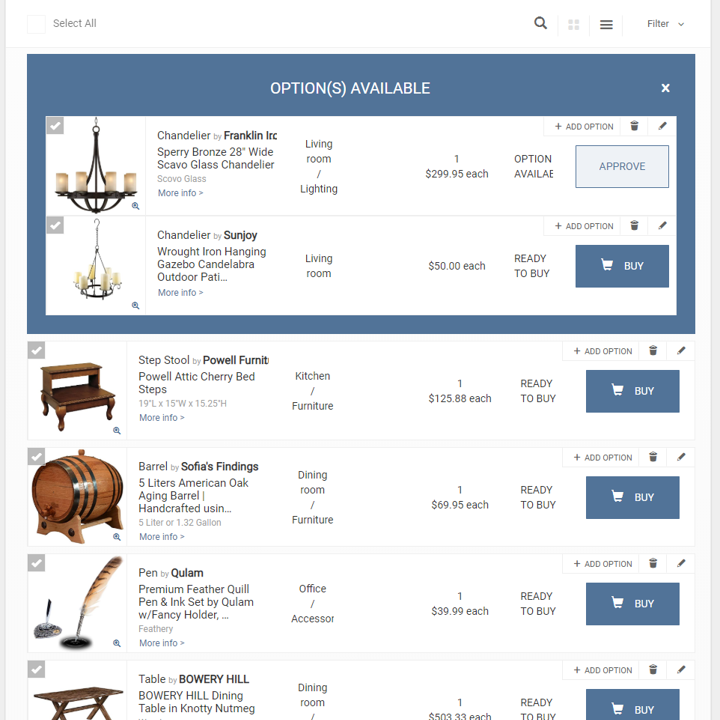 Access your projects on your computer or on your mobile device so you and your team always have access to your spec sheet for making purchases, looking up product names and brands, making decisions on the go, or reviewing items after project completion.